An independent research carried out by Capital Economics for TransferWise showed that Australians spent $3.9 billion as fees when exchanging currencies in 2016. Of this, $3.1 billion came in the form of hidden rate markups and card usage charges. In the UK, SMEs were overcharged by around £4 billion in 2015. Data released in the Remittances Worldwide Prices (RPW) report suggests that the average cost of carrying out a $100 transfer has dropped from 8.93% to 7.52%, from 2013 to 2015. Another report shows that while the average cost of using a bank is around 11%, it drops to 5.32% for online overseas money transfer companies. Surprisingly, a significant number of people still turn to banks when they need to send money overseas. How much you end up paying as fees when sending money overseas depends on multiple factors, and you typically get to know of the fees mentioned below before finalizing your transfer. Amount you wish to send. Some companies have fee-free thresholds, and if you send less than the minimum limit, you will need to pay a fee. If you work with a company that charges a percentage of the transfer amount as fees, you will need to keep an eye on how much you need to pay when transferring large amounts. Transfer method. Transferring money to an overseas bank account is typically more cost effective than sending money to a cash pickup center. Payment method. Paying using your bank account is usually cheaper than using your debit card. Credit card payments tend to attract the highest fees. Speed. If you want to carry out an expedited or same-day transfer, prepare to pay an additional fee. If you come by a bank or a money transfer company that claims to offer fee-free transfers, you have good reason to be wary. 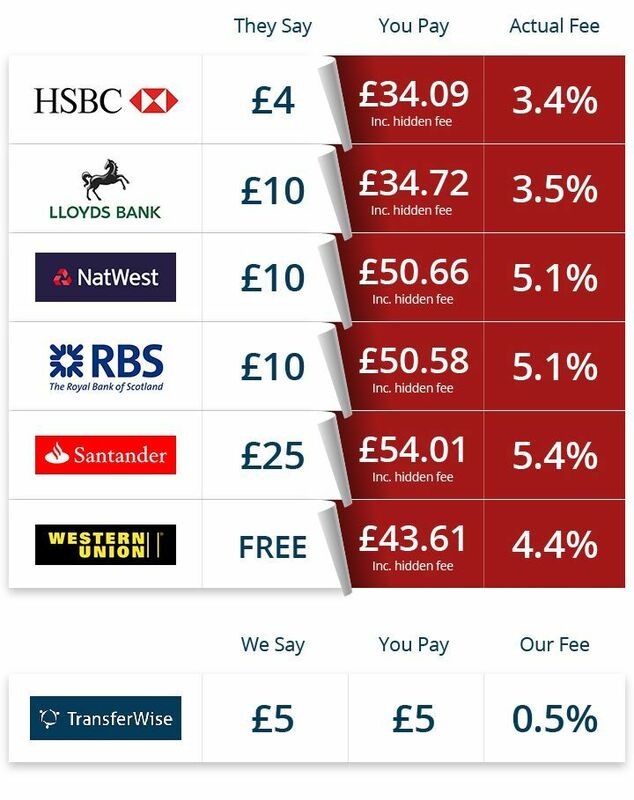 According to an infographic released by TransferWise, overseas money transfers carried out by banks and high street forex companies come with noticeable hidden fees. For example, while HSBC claims to charge £4 for sending £1,000 from the UK to Europe, the actual cost is £34.09. Western Union claims to offer a fee-free transfer, but ends up charging £43.61. Hidden fees usually come in the form of exchange rate spreads. Just about every bank and overseas money transfer company lists its own exchange rates. These are not the same as the interbank rates you get to see on Google or XE. The rate you get, as a result, comes with a markup and includes the exchange rate spread. Since this spread varies from one service provider to the next, so does the cost of your transfer. Several banks are overseas money transfer companies provide online currency calculators that their customers may use to check existing exchange rates and applicable fees. Only, some of the calculators provide interbank rates, and not the actual rates provided by the company. In such a scenario, you get to find out the real cost of your transfer at a later stage. When using an online calculator, determine if the rate you see is the one that will apply on your transfer, or you might be in for a surprise later. Which Money Transfer Company is the Most Cost Effective? The corresponding table gives you an indication of transfer fees charged by different money transfer companies for sending money from the U.S. Using your bank to send money overseas might seem convenient, but data goes to show that turning to a specialist money transfer company can lead to savings. While the money you save might not seem like much when sending a small amount, it can add up to a tidy sum if you carry out a large value transfer or if you plan to send money regularly.